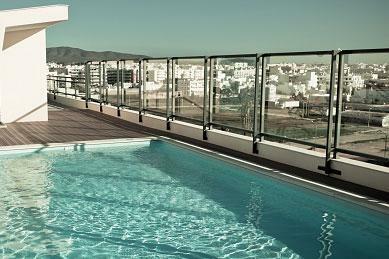 Without a doubt, swimming pools can be the source of family fun and entertainment. However, the tragic reality is drowning is the leading cause for injury death in the United States for children ages 1 to 4 according to The Centers for Disease Control and Prevention. This source also states that, on average, 10 people die each day from drowning, and two of those are children 14 and younger. According to the CDC, a four-sided isolation fence -- one separating the pool from the yard -- reduces a child's risk of drowning by 83 percent. One common and safe way to keep a child from accessing a pool is installing a mesh fence. These temporary fences are strong, durable, and lightweight. Placed a few feet from the edge of the pool, they can be installed by a skilled handyman. The project mostly consists of drilling holes into the concrete for fence post placement. A newer no-drill method uses a water-filled base to hold the fence in place. 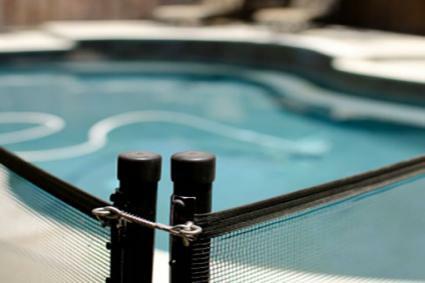 Buy mesh fence at pool supply shops, home improvement stores, or department stores. Mesh fences are easy to install, lightweight, and work like a traditional fence with gates and sections. Remove the fence, if desired, when children are not present. Based on region of the country, mesh fences cost about $15-$20 per linear foot installed. 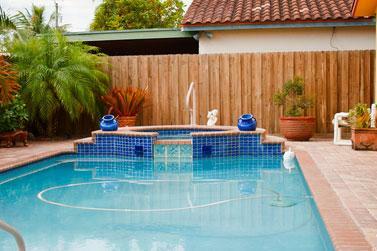 Since mesh fencing follows the edge of the pool, less footage is needed compared to a perimeter fence. With this type of fencing, the safety component depends on the quality of the posts. Lower-quality posts bend, snap, or break and can create a greater safety hazard if the child is trapped in the mesh. Since children (and even adults) may lean or fall into the fence, use posts able to withstand that force. The higher the tensile strength of the posts, the safer the product. For ultimate safety, a traditional fence should be the first line of defense. This is especially important because it can prevent neighborhood children from accessing the pool. Local and state regulations often dictate the height, style, and gates for traditional fences. However in general, options range from wooden privacy to metal wrought-iron designs. These fences are more durable but costlier than a mesh fence. 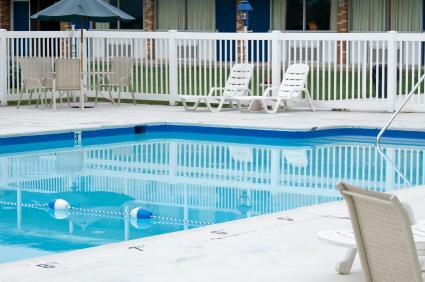 Part of the cost is due to the extra linear footage, since this fence does not follow a pool's perimeter. Skilled do-it-yourselfers should be able to install all these fences, except the glass one. Metal, wood, and vinyl fencing material can be purchased at home improvement stores. The two most popular types of metal fences are chain link and wrought iron. Despite being on the lower end of the price range (homeowner-installed chain-link fences range from $3-$6 per linear foot) these fences are not sub-quality. They are durable and low-maintenance. Aluminum fences, often in traditional wrought iron designs, are very durable and do not rust. They are more expensive, starting around $24 per linear foot, installed. Although skills, like plumbing the fence and stretching the fence material are required, this category of fence is the easiest to install. Chain-link fences can be made more attractive with decorative slats. Wrought-iron designs provide a classic look -- one that rarely goes out of style. As with all pool fences, pay special attention to the gate-locking system. Chain-link fences are not very attractive. When damaged, repairs often require replacing large sections of the wire mesh to maintain a pleasing, cosmetic look. Wooden privacy fences are a mainstay American tradition and are a common do-it-yourself project. Patterns vary widely, so double check local regulations to ensure compliance with the law. Professionally installed fences cost about $16 per linear foot, but you can cut the cost by about 50 percent if you install it yourself. Although home improvement stores install fences, most communities have a handful of professional fencing companies. Double check a company's rating with the local Chamber of Commerce or the BBB before hiring them. Wood fencing comes in a variety of styles. It offers the best choice in keeping with U.S. Consumer Safety Product Commission guidelines. Solid wood fencing prevents a child from slipping between slats. Wooden fences are durable, can be stained or painted as desired and, if cared for properly, last for years. There are drawbacks to wood fences, as well. Wooden fences need periodic upkeep, such as painting or staining the wood, to lengthen the life of the fence. Occasionally, posts or slats will need to be replaced. Fences installed on sloped or uneven ground increase costs and require additional installation skills. Vinyl fencing has the same basic look as a wooden fence, but the key benefit of vinyl is its low-maintenance. Vinyl fences can be installed by a skilled do-it-yourself handyman, although many homeowners rely on a professional company. Just like wooden fences, this is a labor-intensive project. Vinyl costs more upfront that a wood fence -- around $40 per linear foot -- and panels are typically sold in six-foot lengths (instead of eight-foot for wood), requiring the installation of more fence posts. Since the posts are secured in concrete, this usually extends installation by a day or two so the concrete can harden. Repairs are more costly than wood since sections, instead of slats, must be replaced. Of all the pool fence designs, glass is definitely the most luxurious, but it is also the most expensive. On average, it costs more than $100 per linear foot, and it is not a project easily handled by a do-it-yourselfer. In fact, unless you install these fences professionally, it is a job best left to a company specializing in the work. They are beautiful and durable. 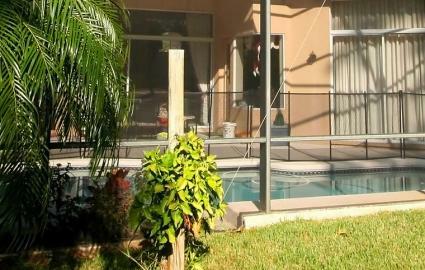 These fences let you to showcase your pool. They can make your pool area appear larger and more spacious. Repairs can be costly since each fence panel is a sheet of glass and usually requires professional installation. Although regulations concerning home-owned swimming pools are controlled at the local or state level, the CPSC recommends some common sense standards. Locate the barrier in a manner that a child cannot climb over it. Fences should be a least four feet high. Gates and doors should be self-closing or self-latching with locks out of the reach of children. Fence pattern should prevent a child's ability to climb over, under, or between the slats of the fence. 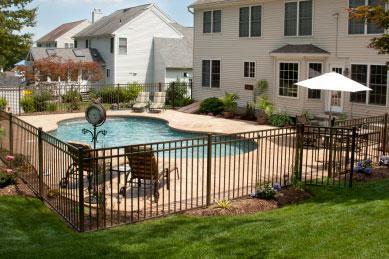 Once the fence is in place, periodically inspect the safety latches, alarms, fence, and posts to maintain a safe swimming environment. Before installing any safeguards, another way to learn best safety practices is to visit the website of the state agency that oversees public and/or private swimming pool regulations where you live. Besides being a great source for state pool laws, often it provides valuable training tools. The state of Indiana's Public Swimming Pool safety page includes a link to an online video game that teaches how to spot someone struggling in a body of water.